Details: Avid golfers love receiving golf-related accessories as gifts for any occasion, so why not reward the golfer in your life with this handsome golf towel? Available in Red, Blue, Green, White, and Black, our towel is extremely absorbent and can be personalized with the initials of the recipient. Includes a convenient hook for hanging. Great for Father’s Day or retirement! 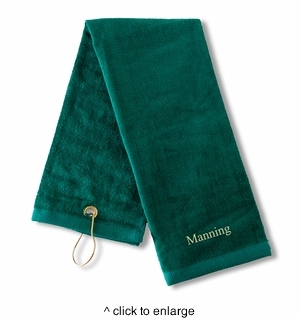 Premium quality Golf Towel made of 100% cotton with plush velour finish. Dobby border hem and brass grommet and hook for convenient attachment to bag. Machine washable.